My previous post focused on the relationship my father built with Royal Lao Army Gen. Vang Pao and the role they played in the CIA’s secret incursion into Nhom Marrott, Laos in 1982 based on information Gen. Vang Pao had received on live POWs and conveyed to my father. The incursion was seven years after the end of the war. It also was about a relationship I built in Laos with a subordinate of Gen. Vang Pao after the end of the war. This post is about other relationships my father and I forged during the Laotian war including  individuals employed by the CIA and deployed in the United States Agency for International Development (USAID) to fight the communist Pathet Lao and the North Vietnamese,  individuals in the International Committee of the Red Cross (ICRC) and the International Control Commission (ICC), which as international humanitarian organizations were promulgating peace in Laos and supporting the 1974 International Agreement on the Declaration on Neutrality of Laos),  individuals in the U.S. military and the U.S. State Department,  pilots in the Royal Lao Air Force, and  my special relationship with Gregory Rodgers at the Vientiane School for the Blind. Please note that the USA did not sign the International Agreement; rather, it agreed to honor it. I am certain you will find this post interesting. For those of you reading my Blog for the first time (this is Post #6), please start at Post #1 (bottom post) and work your way up to #6. For those of you who wish to see what I look like and how I present myself in the POW-MIA issue, please see the TV videos of David Houston’s recent 2-part interview with me. David is a distinguished Reno-based lawyer who interviewed me on his weekly TV show Lawyers, Guns and Money. To see the videos on YouTube, click here; the second interview immediately follows the first. The political and military history of Laos in its 19th and 20th centuries is incredibly complex. I wanted to present recent Laotian history prior to and during the 1960s and into the 1980s because they directly involved the POW-MIA issue. However, even that became cumbersome. I therefore produced the following abbreviated summary. Sufficed to say that the key players in the late 1960s and through the end of the Lao war in 1975 were the anti-communist Royal Lao government backed by the USA, and the pro-communist Pathet Lao (Neo Lao Hak Sat) which for all practical purposes was the communist North Vietnamese in disguise. It was the North Vietnamese army who with backing from Russia and China conducted the successful war against the Royal Lao government and the USA while calling the victory a Pathet Lao undertaking. Between 1973 and 1975 the Laotian landscape saw a relentless North Vietnamese onslaught. Immutable, the countryside was falling into Pathet Lao hands thanks to the USG’s cessation of support in 1974 for the ineffectual and corrupt Royal Lao government and army. Clearly, the USG saw what happened in South Vietnam would happen in Laos. The landscape also saw an array of agreements and treaties between the two sides ostensibly aimed at ending the war but in reality accomplishing nothing. Of particular note was the Provisional Government of National Union, which was to be operationalized by the Lao Agreement and Protocol, represented by the Vientiane Side and the Lao Patriotic Front (the political arm of the Pathet Lao). Also, there was the Joint Commission to Implement the Accords, which included the Regulations on the Exchange of Military Personnel Captured or Detained During the War and on the Gathering of Information About the Missing in Action (MIA). Knowing the Royal Lao government would fall, the USG commenced a withdrawal of all USG personnel in Laos except a small remnant group at the embassy. The USG completed its withdrawal into mid-Summer 1975. The period March-May 1975 was particularly sad because the withdrawal was a near panic. In a sidebar circus, in 1974 the Royal Lao and Pathet Lao even formed a pseudo-coalition government although the war still was underway. While all the agreements and documents always were impressive on paper, they were just intended to accelerate Laos’ collapse and the withdrawal of the USA. Much as the North Vietnamese knew they would win the war in Vietnam and used the Paris Peace Accords to accelerate the USA’s exit from South Vietnam, the North Vietnamese used the various agreements and accords among the USG, Pathet Lao, Royal Lao and international agencies to do likewise in Laos. As I put it, “The communists will sign an agreement with you and give you lots of promises and commitments. Then, you will stand hopelessly aside as they deliver precisely none of their promises and commitments, including accounting for the POWs.” With the North Vietnamese totally in control of all Pathet Lao operations and strategy going back to the 1940s, it was perfectly obvious that Vietnam was the template for Laos. In August 1975 certain civil units of the Pathet Lao peacefully occupied Vientiane under the pseudo-coalition government. However, the PL did not take control of the country; rather, the PL/NVA continued to take other parts of the south by force, rigorously defeating the pathetic Royal Lao army and air forces. I was at Wattay Airport at this time when the leader of the Pathet Lao, Prince Souphanouvong, returned to Vientiane for the first time in decades to participate in the pseudo-coalition government. Prince Souphanouvong became President when Laos finally fell on December 2nd, which is when King Savang Vatthana abdicated and the pro-western Prime Minister, Prince Souvanna Phouma, resigned. 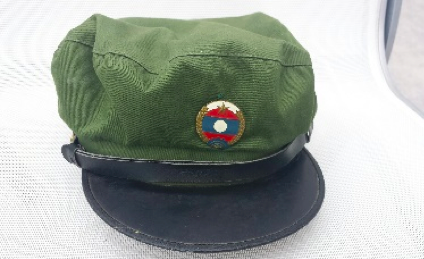 Laos became the Lao People’s Democratic Republic (now the Lao People’s Revolutionary Party). By this time, the USA presence was long gone. The most prominent career CIA individuals assigned to USAID-Laos read like a who’s-who of international intrigue. Most notably were Tony Poshepny (“Tony Poe”) and Edgar (“Pop”) Buell – the two were my contacts – and Ted Shackley (“The Blond Ghost”) and Jack Shirley – both my father’s contacts. Their profiles and histories are in various books and Wikipedia which make fascinating reading of how the CIA operated and how operations have changed since then. These men and all CIA operatives were as committed to fighting communism as intensely as they could be, but their disenchantment became clear as the USA progressively lost the war in Laos. Ted Shackley became the CIA’s Associate Deputy Director of Operations from 1976 to 1977 and published a book, Spymaster, My Life in the CIA. If a CIA employee was lost to the communist Pathet Lao or North Vietnamese he was forever lost to the USA as well. His status in Indochina was disavowed by the USG. This is what he signed up for – no questions asked. I wonder how many hundreds of CIA personnel were lost in Laos. I have heard there were 250 to 500 in aircrew alone. Only the CIA knows, and isn’t telling despite the war ending over 40 years ago. Amusingly, I sometimes met with Tony and Pop at a favorite CIA/USAID watering spot in Vientiane, the Purple Porpoise. I also had come to know a bar-fly there, Monty Banks (whose name is a play on Mountebank – a person who deceives others, especially in order to trick them out of their money). Monty sent tapes to my home at the time in Ridgefield, CT, that I hoped would give me information about Morgan and other POW-MIAs. However, they were so Purple Porpoise alcohol-saturated that I never could make sense of them. Tony was never to be taken lightly. He even offered his Hmong tribesmen cash rewards for every ear of a Pathet Lao soldier they killed. He also sent bags of ears to the US embassy in Vientiane to prove his body counts. However, so I was told, he had to cancel the offer when ear-less children started showing up in Hmong villages. CIA operational staff including Pop and Tony Poe were evacuated in March – May of 1975 because they were prime Pathet Lao targets and the complete Pathet Lao takeover of Laos was certain. I subsequently stayed in touch with Pop and Tony. I communicated with Pop in Thailand, Australia and the U.S., and I also communicated with his sister in the U.S. I visited Tony multiple times in Thailand where he had retired after the war. Many CIA/USAID employees were completely dissatisfied by the U.S. failure in Laos and a number of them retired or set up shop in Thailand rather than coming back to live in the USA. My hope was that Pop’s and Tony’s dissatisfaction regarding the U.S. failure in Laos would encourage them to tell me something concrete about the POW/MIAs. 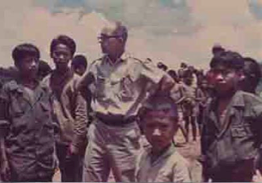 I note that the panic from Laos in 1975 included an estimated 40,000 Hmong who crossed into Thailand. 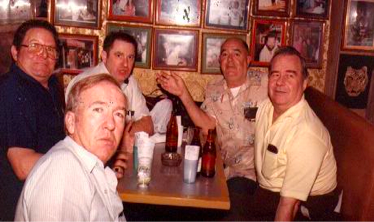 Pop and Tony Poe gave me multiple veiled hints about the POW-MIAs over the years but never any facts I could work with. I have to give them credit for their unswerving commitment to their CIA employer and the U.S. Government. Spilling the beans was (and is) something they signed up not to do, and is something they religiously did not do. Sadly, the outcomes with the heads of the International Committee of the Red Cross (the ICRC – Dr. Jurg Baer and Mr. Werner Blatter), and the International Control Commission (C.R. Gharekan), and others were identical to Tony’s and Pop’s. The ICRC and ICC Directors were sympathetic but it became clear that they could not help me or my father despite them saying very kind things about our search effort. Dr. Baer generously conveyed some letters to Morgan via the Pathet Lao representative in Vientiane, M. Soth Phetrasy (whom I will have more about in a very important future Post). My father and I did not know if Morgan was alive but even asking the letters to be delivered would enhance the POW profile with the Pathet Lao. Sadly, the ICRC and ICC Directors could travel to Sam Neua (Pathet Lao headquarters) when permitted from Vientiane and Sam Neua/Vieng Xai, and I was told by one of my contacts that Mr. Blatter said he had seen American POWs in the caves in Vieng Xai, the Pathet Lao operations base near Sam Neua. However, Mr. Blatter never said that to me or my father. Another – and infinitely more useful – relationship was the one I built with Gregory Rodgers of the Vientiane School for the Blind. My then wife, Dianne Donahue (formerly Dyan), and I first visited him in 1973 at his home and at the school on multiple occasions. He had developed the school from scratch into a highly acclaimed entity. The school for the blind children was a lovely and totally out-of-place compound on the Mekong. At his lovely home in another part of Vientiane Gregory had an array of Laotian treasures that seemed to surpass those of the Lao National Museum. He and I kind of bonded. Dianne and I became benefactors of the school, and he embraced my search for my brother. As best I could tell, he knew just about everyone of importance in Laos including senior government officials. I was absolutely elated to have met him. He also shared with us a closet filled with communications equipment which he used to communicate with whomever across Laos. I did not engage with his personal activities and how he accumulated his wealth in Laos, but I felt I was better off not knowing. As a hint, one of the entities funding the School was USAID, and we all know what the CIA was funding elsewhere in Laos. Gregory and I stayed in touch by writing and telephone. He was dedicated to tracking down Morgan, and he periodically sent me written updates on what and how he was doing. He gave me locations and times of his activities in the countryside and where he thought Morgan might be held. He was in regular radio communication with his people in the Lao countryside. Very sadly, my communication with Gregory collapsed completely in March 1975 when he and the rest of the westerners exited Vientiane ahead of the pending communist takeover. This was a very painful and tragic experience for me because he was delivering real information about the live POWs in Laos. This included a man from the North whom Gregory trusted for over 15 years and whose veracity was without question. This man showed a picture of Morgan (which I had supplied) to a PL colonel who then identified Morgan as a POW in Sonthay, Laos. In August 1975 I was contacted by Gregory’s sister in Hong Kong, Helen Hodgson, who told me Gregory had been able to get out of Vientiane in March 1975 and came to Hong Kong. He died of heart failure three weeks later while in Bangkok. She told me the PL had taken all his art, his home and other possessions, and also had closed the Vientiane School for the Blind. She believed he really died of a broken heart. To me, the school was a magnificent entity because it was not only healing the blind children but also teaching things that enabled them to have productive lives such as music and massage. As an anecdote to that, many of the children in the school had scars on both sides of their temples where North Vietnamese soldiers had shot them. The bullet entry points were clean and the exit points messy. Separately, I note that when Laos fell to the communists, the Pathet Lao and North Vietnamese inflicted great suffering on the Hmong which continues to this day. Prince Souphanouvong, the PL leader who became the first president of the Lao People’s Democratic Republic, even said he would eliminate the Hmong from the earth. There were other individuals who in particular helped my father and me as much as they could. One was Paul Skuse, a senior USAID police advisor to Lao Police Force. He harvested his network in Laos as best he could to find out what happened to Morgan. He was in close contact with my father from just after Morgan was lost in late 1968 until the US withdrawal from Laos in mid-1975. All I have to say is “God bless him.” He tried very hard. Sadly, his efforts came to a halt too when he was evacuated from Laos. Another was Robert Myers, Jr., First Secretary of the U.S. Embassy in Vientiane. Robert was obligated to follow diplomatic protocol regarding the POW-MIA issue but he made a serious effort to keep me posted about developments and strategy among the various entities on the POW-MIA issue. In 1973 and 1974, Robert arranged some key meetings for me with representatives of the Pathet Lao (most notably Phoumi Vongvichit, a senior PL officer who became #3 in the government of the new Lao People’s Democratic Republic), North Vietnam (Nguyen Van Khoi), and China (Chao Ho Tien). He also was the individual who introduced us to the International Committee of the Red Cross, the International Control Commission, and Gregory Rodgers. Another USAID person who had a huge impact on me was Richard Miller, a U.S. Army officer seconded to USAID. He became very supportive and introduced me to a Royal Lao Air Force colonel, Col. Sampson (I cannot use his real name in case he still is alive). He was vastly sympathetic to the fact my brother was lost supporting the Royal Lao government against the communists and that my father and I were trying our hardest to find my brother along with other POW-MIAs. Col. Sampson engaged several of his pilots to help us. From their unofficial intelligence – our mission was completely off the record – they delineated a PL prison camp that we felt we could penetrate and liberate the POWs there. My next trip to Vientiane in the summer of 1975 was to finalize the mission. We would fly Royal Lao helicopters from Vientiane to a designated site and then travel on foot to the POW site. We would capture the site and bring the US POWs back across the border into Thailand. This was an intense undertaking. Certainly, it was far beyond anything the US Government was doing to bring home missing POWs. The mission was named Operation Big John (what my mother affectionately called my father). I remained close to my phone for several months waiting for it to ring calling me to Vientiane to start Operation Big John. Sadly, the fall of Vientiane meant the loss of Operation Big John, although Richard stayed in touch with my father and me for several years after that. Dianne and I went to Vientiane in the summertime of 1975 to try and meet with whomever was still there, but we got trapped in the exodus. Our airline tickets for getting out of Laos were absolutely worthless because it literally took gold to exit the country; Vientiane was one of the gold capitals of the world, albeit much less sophisticated. The American Embassy was busy taking care of the USAID remnants and had no time for us. However, Richard Miller had introduced us to a Philippine woman, Adelaida (Ida) Cuevas, who was a working in the USAID/Laos Audit Office in Vientiane. USAID would not secure her release out of Laos because she was not a US citizen. Richard had integrated her thoroughly into Operation Big John before his impending departure, and she was put in control when he exited Laos. The immediate challenge for the three of us, though, was to find a way to get out of the country. There were so many people fleeing from Vientiane across the Mekong River that it was not realistic for us to join the melee. Instead, Ida suggested we pay a driver enough money to drive us further east to the Mekong where, hopefully, we could pay for a boat to take us across the river into Thailand. The trip toward the river was downright scary because the PL/NVA front was approaching Vientiane and we could hear the guns, artillery and everything else in the distance. When the driver stopped along the Mekong and would not go any further the three of us scurried down the steep hill to the river. The Mekong was approaching its seasonal low – albeit still wide and fast – and we had to descend several hundred feet to get to it. We approached several boats and after being paid handsomely by me, one of them ferried us across in his classic long, skinny Lao boat to Thailand. Ida knew we should walk until we found some railroad tracks. She knew the Thai railroad came through Nong Khai province and likely came through the town of Nong Khai, which was close to the Mekong. We found the tracks and walked it until it reached Nong Khai. Ida spoke enough Thai to be told there was a train every day going south, but we had missed it and there would not be another one until very late that evening. We caught that train, and after about what seemed at least 12 hours or so, we arrived in the central depot in Bangkok. Laos Frees US Teacher. Laos communist-dominated government released American Rosemary Conway on Monday after more than two months detention on spying accusations. The Foreign Ministry said this was being done as a “goodwill gesture” toward the United States. Miss Conway, a 37 year old teacher from Chicago and Las Vegas, was not available for comment. She was to leave for Thailand on Tuesday. After her release Miss Conway said she had heard multiple conversations among Pathet Lao soldiers about the POWs and Morgan and had seen PL documents citing him as imprisoned by the PL along with other POW-MIAs (she was conversant in Lao). I have not seen a denial or confirmation by the CIA that she was or was not a CIA employee. However, I have seen citations that she passed three polygraph tests affirming what she said about Morgan. When my father met with Miss Conway she was adamant about what she heard and saw. As every American who came forward with information about U.S. POW-MIAs, Rosemary Conway ultimately was discredited by the USG. Discrediting contrary voices – that there were live POW-MIAs left behind in Laos and Vietnam after Operation Homecoming – continues to this day. It has included discrediting USG employees, active duty and retired military, Lao refugees, POW-MIA families and concerned citizens, and more. The USG relentlessly enforces the “all the POW-MIAs came home during Operation Homecoming” policy and discredits everyone who speaks to the contrary. Rosemary was an easy target for her USG interrogators because she had no evidence affirming what she had seen while in captivity and because she was unable to withstand the interrogation onslaught. What a tragic outcome for the integrity of the USA when just the up-front truth would have been the honest and noble outcome. I also have in my notes Messrs. Don Olson and Del Spier, USAID officers in Vientiane, whose support of my father not only was profoundly appreciated by my father during the war but is also appreciated by me ever since. I was not well integrated into their efforts with my father, so I am not able to adequately describe them. They continued to support my father after the fall of Vientiane but could not do much given the complete Pathet Lao/NVA takeover. The USG is not going to engage in the live POW-MIA issue until it sees a live POW. USG policy is that all the POWs came home in conjunction with Operation Homecoming. There are zero USG resources to the live POW-MIA issue; rather, it is focused solely on (1) investigation of crash site remains, and (2) discrediting anyone who had or has information about live POW-MIAs. Bringing home a live POWs thus is the burden of the families and concerned citizens. My father and I discerned that very early in the process, and we lived with it and pursued it from day one. Shifting the burden to the families was another brilliant maneuver by the USG to buttress the policy. If you do not believe my statements across my Posts that the USG’s policy of all the live POW-MIAs having come home at the end of Operation Homecoming is utterly and totally fraudulent, then beyond the books I have cited for you please just read Bits ‘N’ Pieces,” a monthly publication of the National Alliance of Families of America’s Missing Servicemen – WWII + Korea + Vietnam + Gulf Wars + Afghanistan. Bits ‘N’ Pieces is produced by Lynn O’Shea and Janella Apodaca (produced many years by her mom, Dolores Apodaca) and has a 20-year history of publishing Bits ‘N’ Pieces and the truth. Bits ‘N’ Pieces proves the POW-MIA issue will not go away and the families and concerned citizens will not give up despite the pervasive suffering caused by the USG’s policy. Bits ‘N’ Pieces is a powerful publication. Access the Bits ‘N’ Newsletter at http://www.nationalalliance.org/alliance_files/bits.html and go further to the Newsletter Archives for a history of the Newsletter through this month (July 2015). While all the Newsletters overwhelm me due to the depth and breadth of the Alliance’s research, go to the Newsletters for September 4, 11, 18 and 26, 2004 in particular. There you will find even more comprehensive proof of pervasive evidence of live POW-MIAs being left behind in WWII, Korea and Vietnam and that the USG will stop at nothing to protect the lie. The evidence and the lie carry on to all the Newsletters since then. My next post will be about Bill Shemeley’s and my involvement with the Phetrasy family in Laos. M. Soth Phetrasy was a senior official in the Lao Patriotic Front government which took control of his country, and he was a revered hero of the Lao revolution. Phetrasy was the Pathet Lao representative who, during the war, said on multiple public occasions, including to my mother and father, that the PL were holding American POWs and would give them to the USA when a treaty was signed between the two countries. Bill and I developed excellent ties with him and his family, and Bill is practically a member of the Phetrasy family. Separately, in my father’s files I found I letter from my brother saying he had been promoted to First Lieutenant. I did not know it. Morgan was promoted at what appears to be a week before he was lost. He subsequently was promoted to Captain and Major although in MIA status. That was standard military procedure. I have recommended a number of books which are transformative in terms of awareness about the live POW-MIAs being left behind after Operation Homecoming. These were Lynn O’Shea’s Abandoned in Place, Mark Sauter’s and John Zimmerlee’s 2013 American Trophies, and Mark Sauter’s and Jim Sander’s 1993 The Men We Left Behind: Henry Kissinger, the Politics of Deceit and the Tragic Fate of POWs After the Vietnam War. Another book at the top of the list is Congressman Billy Hendon’s and Elizabeth (Beth) Stewart’s exceptional An Enormous Crime, the Definitive Account of American POWs Abandoned in Southeast Asia. Indeed, if I am not mistaken, An Enormous Crime was on the New York Times Best Seller list shortly after publication. It is a powerful book. If anyone maintains that no POW/MIAs were left behind after Operation Homecoming, this book, too, is all you need to refute his or her misguided belief.